DAYTONA BEACH, Fla.—Driving the No. 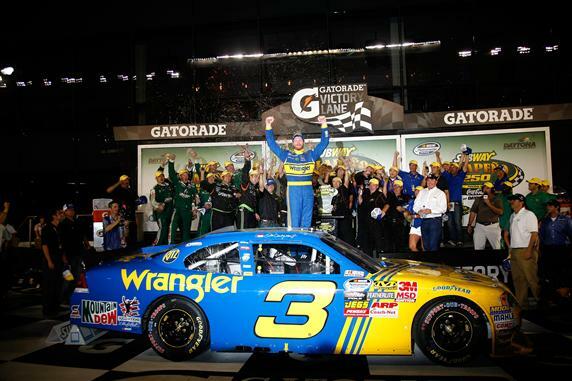 3 Wrangler Chevrolet in honor of his late father, Dale Earnhardt Jr. broke a NASCAR Nationwide Series drought of almost four years in winning Friday night's Subway Jalapeno 250 NASCAR Nationwide Series race at Daytona International Speedway. Earnhardt's emotional win was the result of a collaboration between owner Richard Childress, Teresa Earnhardt, JR Motorsports and Hendrick Motorsports, which supplied the engine for the No. 3 car. The victory, the 23rd of Earnhardt's career, was his first in the series since Aug. 19, 2006, when he took the checkered flag at Michigan. It was his first points win in any of NASCAR's top three series since June 15, 2008, when Earnhardt captured the Lifelock 400 NASCAR Sprint Cup race, again at Michigan. In a race that saw the debut of NASCAR's new Nationwide Series car, Earnhardt held off runner-up Joey Logano and third-place finisher Ricky Stenhouse Jr. in a green-white-checkered-flag finish that took the race two laps beyond its scheduled distance of 100 laps. "I worked hard to try to win, not only for daddy—I'm proud of him going to the Hall of Fame, and he would be proud of this, I'm sure—but just all these fans. I hope they enjoyed this. This is it—no more '3' for me. That's it." With a push from Justin Allgaier, Earnhardt took the lead for the first time on Lap 70, surging past Kyle Busch through Turns 1 and 2. On that same lap, NASCAR called a caution for debris on the backstretch. Pitting under the caution, Earnhardt retained his lead, thanks to a quick, problem-free stop by Earnhardt's No. 88 Sprint Cup crew, which volunteered for the race. Earnhardt held the top spot through Lap 96, when NASCAR threw a debris caution that set up a two-lap run to the finish. Earnhardt stayed out on old tires, as did seven other contending cars, but Busch, Carl Edwards, Clint Bowyer, Trevor Bayne and Ryan Newman came to the pits for tires under the yellow. The strategy didn't work for those drivers, as track position proved more beneficial that fresh rubber. Points leader Brad Keselowski and Kevin Harvick ran fourth and fifth, respectively, on old tires. Keselowski extended his margin in the standings to 277 points over second-place Edwards, who finished 11th Saturday. But the day belonged to Earnhardt. "It's emotional," he said. "I'm proud of myself. I'm proud to have done what I did with this group." Childress, who won six Sprint Cup championships as Dale Earnhardt Sr.'s car owner, told Earnhardt Jr. his father would have been proud. "He just said that daddy would have been happy, real happy," Earnhardt said. "And who would know better than him?"